This can be something as simple as a chart of the stock price versus the S&P 500. Notice, in the chart below, so we support going back 20 years. We also changed the tear sheet, so you can visualize the fact that the stock is only 62% of it’s all time high (look on the right, midway down in the table). 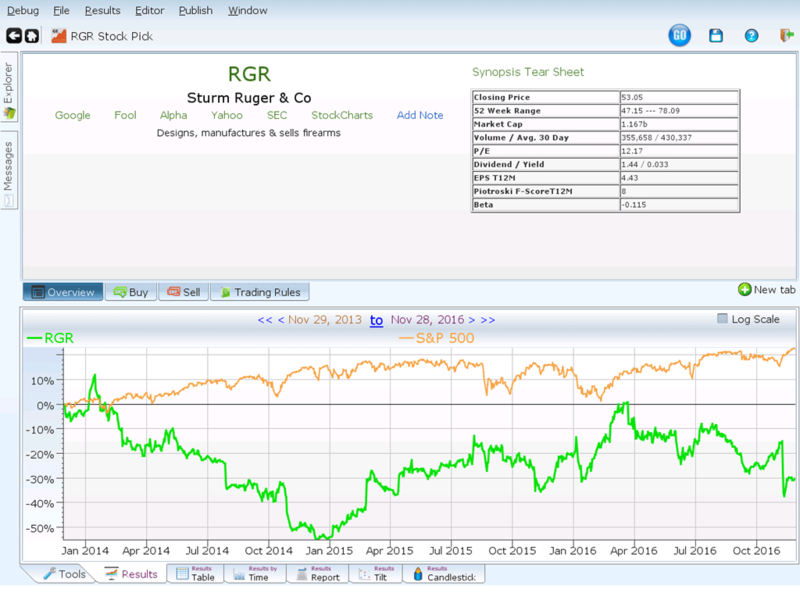 See the blue line for a plot of the industry, so we can see that Sturm Ruger and Co should be doing better. The question is: where did RGR do poorly? And why? Lets chart earnings, revenue and cash flow. Notice that the operating cash flow (pink line) and the income (blue line) spent a lot of time going down from 1995 to about 2009. The stock, meanwhile went sideways. So the secular sideways trend was because the company wasn’t earning any more money than it was last year (actually less in most cases). Unsurprisingly, investors didn’t rush to buy more shares. Look at the spike near the end of the chart. Early in 2014, the stock reached an all time high, and operating cash flow went down for the next year, as did revenue and earnings. 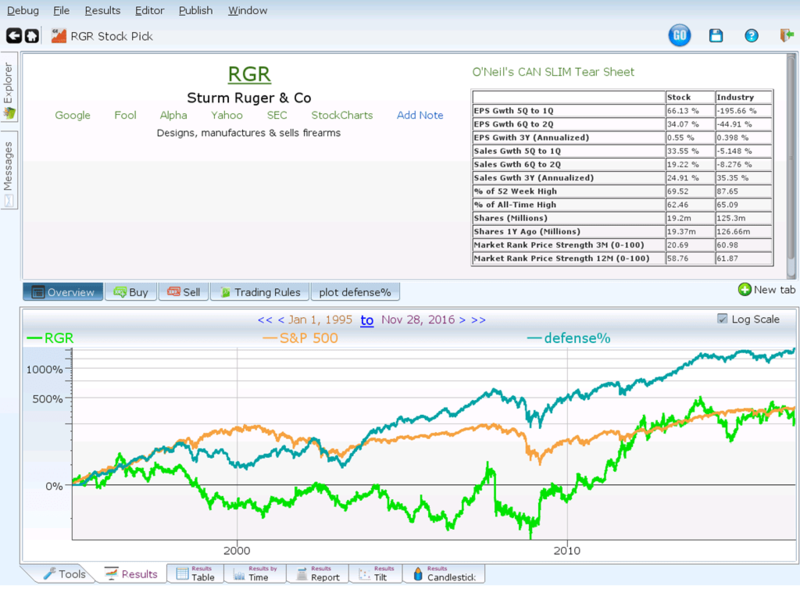 You now know that RGR’s income is very volatile, and there’s little sustained growth, and you can see what that will do for investors in the stock. You want to know more: perhaps the stock wasn’t making more money because the sector is in decline. Let’s find out. We can total up all the income across all companies in each sector, and plot that (pink line). We will also do this for revenue (blue line) and cash flow (brown line). The sector’s revenue kept increasing, along with income and cash flow. So that kills that theory. When we focus into the industry, we see that it still makes no difference. The operating cash flow (Blue), revenue (pink), and income (brown) are all going up. 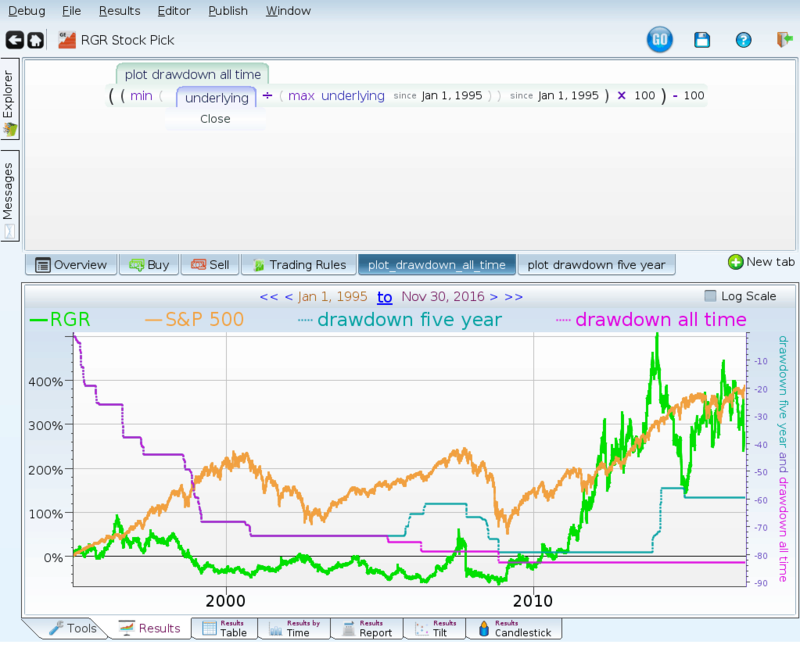 We can also look at RGR’s maximum drawdown. If you look down, you see we defined maximum drawdown (distance from the highest peak to the lowest valley) in our system for this example, to make it easy to follow. Notice that RGR has spent a lot of time far below it’s all time high. 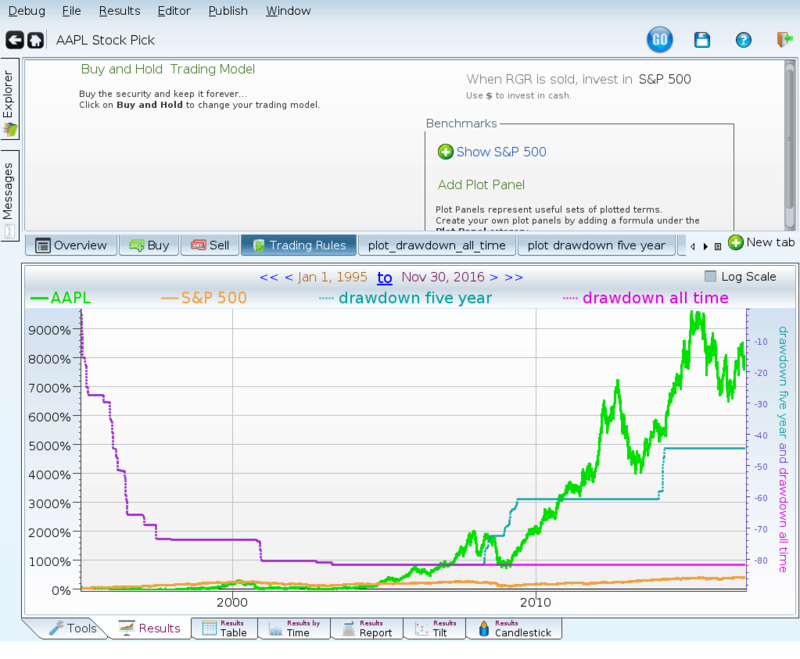 The five year maximum drawdown is more typical of what an investor will see in Google Finance, as long charts aren’t popular. Either way, it doesn’t look good for RGR. How does that compare to a volatile stock that had better performance. Apple will serve as an example. 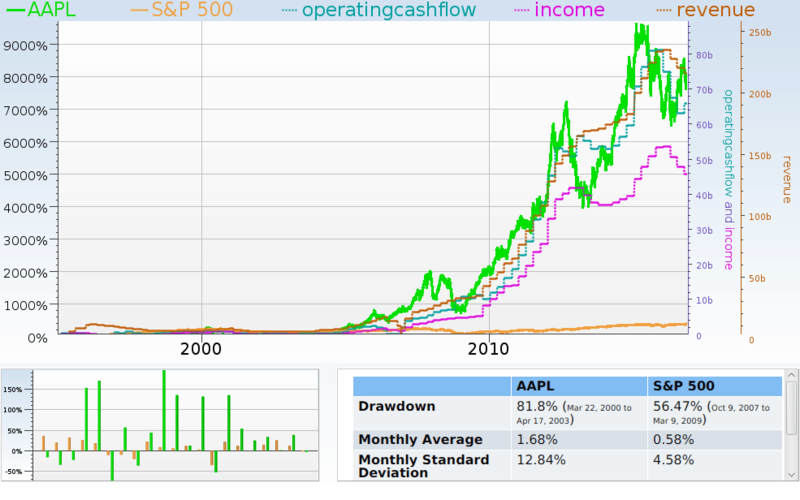 Here is Apple, plotted with its maximum drawdowns, both five year and rolling. Next up is the earnings plot. Look! The lines all move in the same direction! Perhaps Apple went up year after year because it’s earnings went up year after year. Notice that the early 2000’s are the exception that prove the rule. Earnings, cash flow, and revenue all meandered during this time, and so did the stock price. When they started going up, so did Apple’s stock price. Apple has a very nice chart. Ruger’s chart is not so nice. It is in a good industry, and sector, and yet it does not perform as well as it’s sector. Earnings, Revenue, and cashflow correspond with the stock price. You can learn a lot about a stock by looking at its charts. 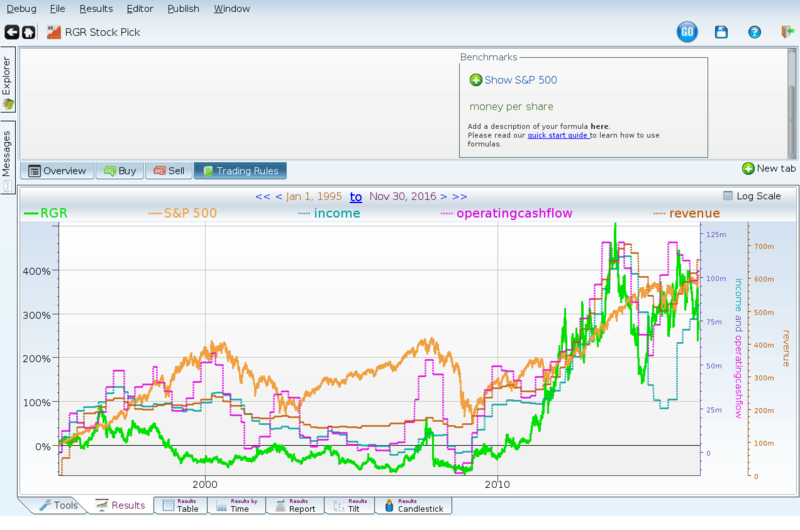 Equities Lab can do a variety of useful charts.